OMG I love making stuff! Since I made a commitment to myself recently to get more creative, I’ve been making at least one little thing each day. Often at night I would just zone out in front of the TV, too tired to do anything but not quite ready to go to bed to sleep to wake up and do the treadmill all over again. However as I said, I recently decided not to compromise myself any more. Instead of slogging my guts out trying to make more money so I can relax and get more creative I had a bit of a Eureka moment where I realised I was doing life cart-before-the-horseish. So for the last few days (yeah it was a very recent aha moment), I have been focusing on creativity first and trusting the moolah will roll in along the way anyway. Sure, I’m still doing my regular part-time job. I’m not stupid and not about to unrealistically step way out of my comfort zone to become a starving artist. Instead, I’m opting for a daily dose of creativity. Arting for art’s sake. Because really, that’s much more aligned with my core self. I’ve done the responsible thing for years at the expense of my own inner happiness and sometimes health. Not any more. Opening my eyes a bit more widely as I come through my mid-life transition is showing me very clearly that my soul – my creative essence – will create or I will suffer the consequences. As they say, you can’t follow two masters. So I’m balancing my life differently. I guess on the outside people who know me wouldn’t think I was doing anything differently except being more productive in the creative department. But I know. Deep down, I know that I’m valuing myself more. I’m prioritising my values better. I’m listening to my inner ‘master’ – the one who knows me best. My core self. I’ve ignored it’s heart-yearning for too long and now I’m just going to follow my passion. I so get that saying now. Certainly in the “do what you love” sense. I was starting to feel deep down to my core that my life was becoming a tad on the meaningless side. Too many shades of grey were seeping across my multi-coloured inner texture. How long can a soul suspend their true identity before they lose themselves? I guess it depends on the soul. All I know is that I reached a turning point recently. One of those make your mind up moments of the make or break kind. I realised I wanted to spend another fifty plus years having a more fulfilled and fun life than in my first fifty odd years. But I had to make some real changes. Now I get to play each day. I play with colour. I play with texture. I create for the fun of it. And I share it with you, here. Now I have three cuffs – Green, Maroon, Blue. 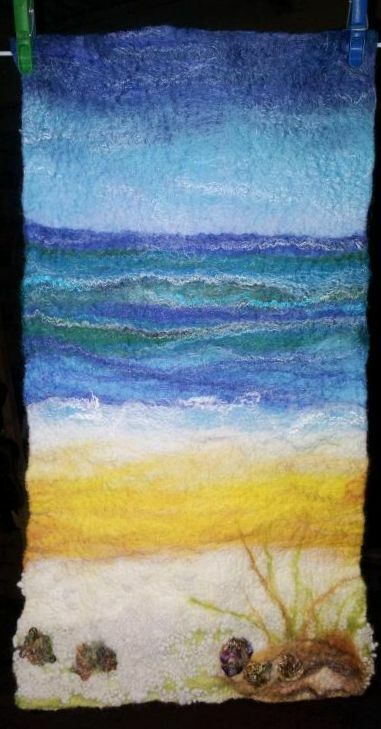 To make each, I cut 4cm strips from pieces of felt I had made previously. The felt pieces are all made of Australian merino wool with silk rovings. Then I hand embroidered them with glass beads and finished with hand-made buttons. I made the maroon one last night. Two of the buttons are of mother-of-pearl with glass beads added as I sewed them on. The red button was made by gluing red glass beads and a freshwater pearl to a larger button. Button holes and edging are blanket stitched in embroider’s cotton. Here’s the other side of the maroon cuff showing a lovely cushioned patch of black wool that I made by twisting a thick piece of roving into a closed circle and adding before felting. The red heart-shaped bead was sewn on when dry. 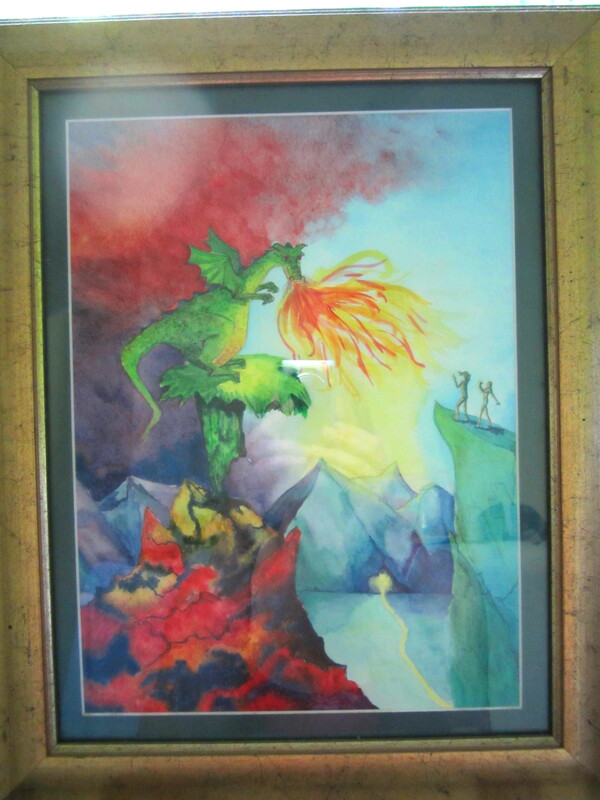 Here’s my wall hanging in my consultation room. This morning I decided that I’d rather see it hanging up than lying on a bench gathering dust, or in a box having its ‘dharma’ (or reason of being) wasted. I found a nice straight stick in my garden that I think adds to the rustic feel of the painting and threaded it through the tabs on the backing fabric. 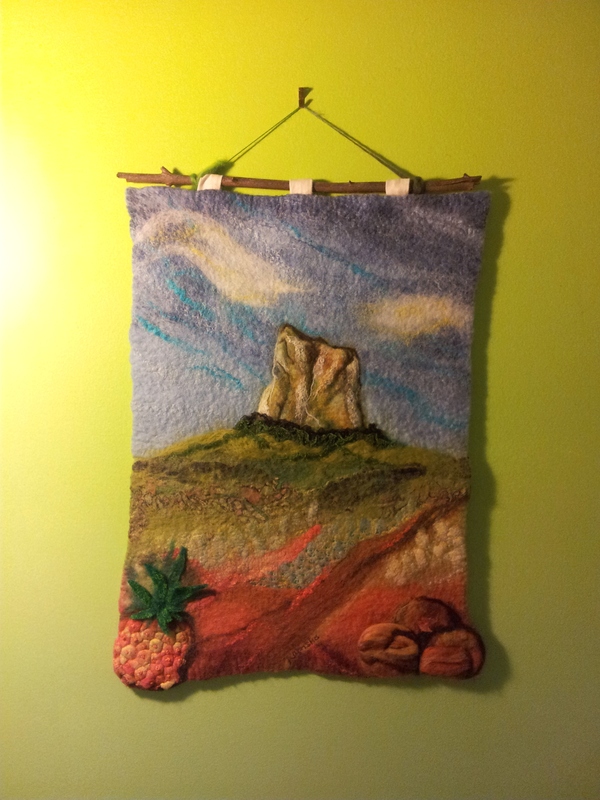 Then I hung it from a hook using green dimensional wool. I took the photos at night, so the colours aren’t accurate; the lime green wall looks more like avocado in this pic! 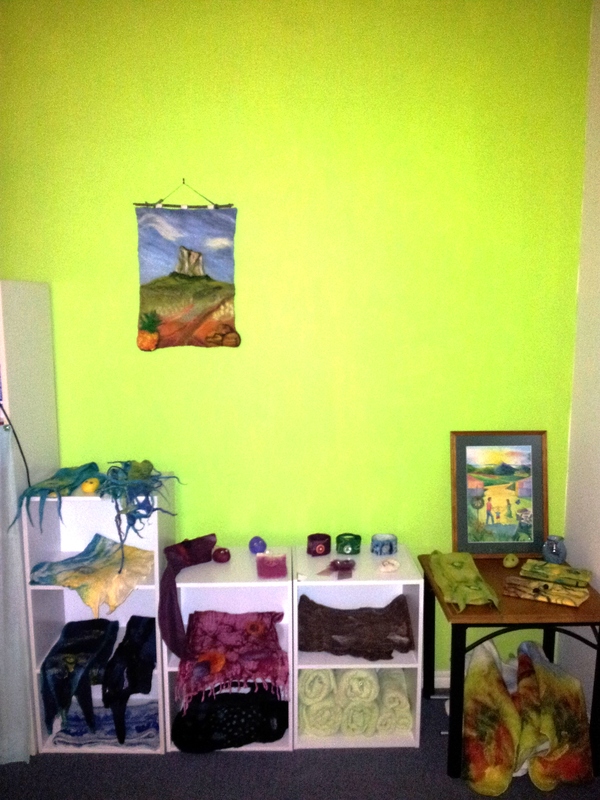 After I did that, I re-organised my felt pieces and realise how little I’ve got left after last market. I’ve certainly got a lot of creating to do before the next market. What a good thing I’ve decided to create something each day! Off the cuff – another bracelet! After I tweaked my blue cuff/bracelet yesterday, by making a button hole and removing the press stud I felt happy that it would be more secure on the wrist. 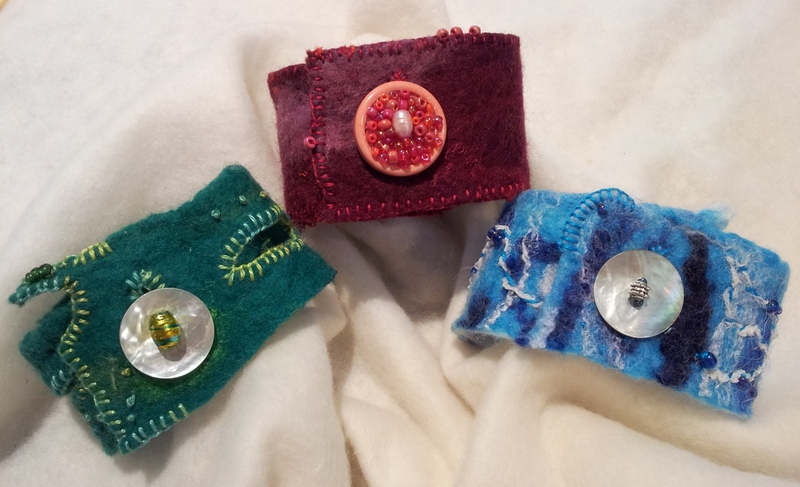 I loved the blue Ocean cuff, and went through my felt pieces, finding a lovely rich green piece with silk tops and some dimensional wool in the fabric. The section I cut for the cuff had some leaf-shapes already removed and it all reminded me of a rainforest. Using some multi-shaded green cotton I blanket-stitched around the holes and the button hole, and added some little french knots in groups of three. It still needed something, so I added little green glass beads, also in threes and a tad more blanket stitch around some of the edge to give definition to the shape. Finally I was pleased! The button I used is a mother of pearl base with a multi-green oval glass bead on top. Coooool! 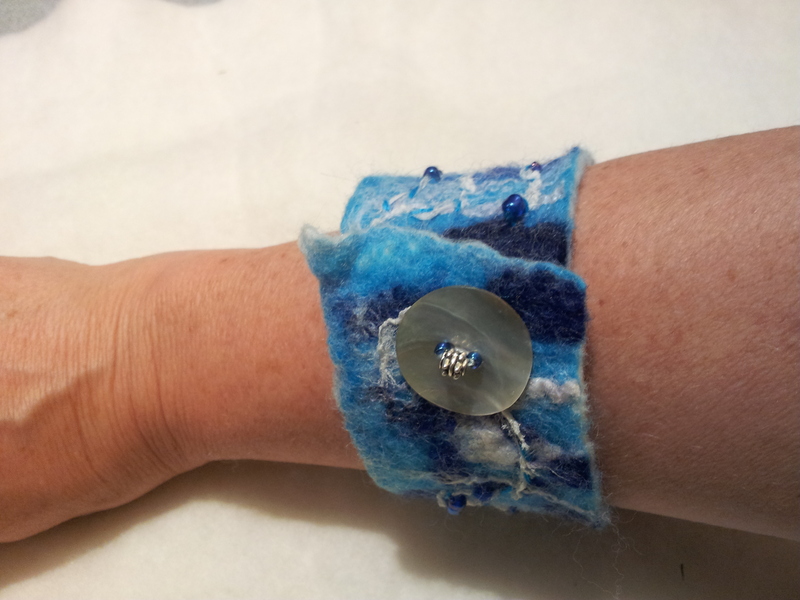 Here are a couple of pics of the finished Rainforest cuff, including the revamped Ocean cuff. Tip: If you cut out a piece of felt and don’t like the rough raw edge, but don’t want to wet-felt the edge and dry it, you can always needle-felt the edge from the right side, and eventually, it felts together giving a nicer, more finished look and feel.